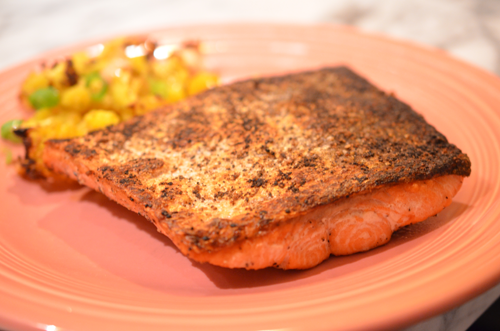 Simple Dishes: Pan-Seared Wild Sockeye Salmon | eat. live. paleo. 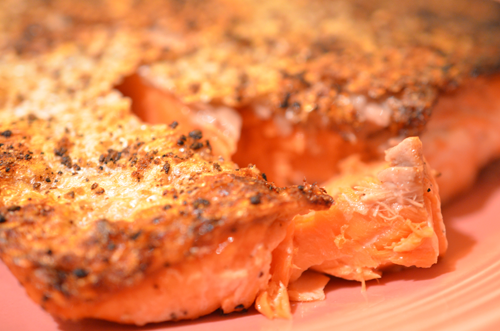 Bring the salmon filets to room temperature. Generously salt and pepper both sides of the salmon filets. In a non-stick pan, drizzle some olive oil and heat over medium high heat. Place the salmon filets in the pan, skin-side down. Cook for 5 minutes. Flip the filets, and cook for another 2 minutes. 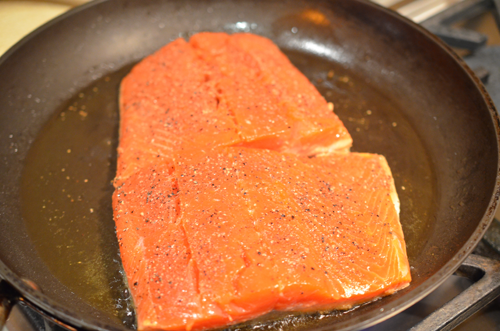 Turn off the heat, but keep the salmon in the pan for another 1 minute. Take the filets out of the pan and onto a plate. Let them rest for a few minutes, then serve with a lemon wedge (optional). The filets will be medium-rare. Happy eating good Omega-3 fatty acids! Made this salmon tonight and it was delicious. Thanks!